This is a write-up of my IATEFL Liverpool 2019 presentation. I decided to present it without slides, which made a pleasant change 🙂 This blogpost follows the same structure as my talk. In many countries in the world there is a minimum language level required by the government for state school teachers. An informal facebook survey I did showed this is most commonly B2, for example in Chile, Poland and Italy. B1 is required in Andalucia, while C1 is required in Belgium and Germany. (Thanks to everyone who replied – there were more places but I can’t fit them all in here!) However, these requirements are relatively recent, they are not universal, and they are generally not retroactively applied. It seems that only recently qualified teachers need to have evidence that they have achieved the required level, and there are many, many people teaching English with B1 or lower. I state this as a simple fact, rather than as a judgement. Despite forming such a large part of our profession, B1-level English teachers are unlikely to present at international conferences like IATEFL due to the language level required to keep up with such a conference. I therefore decided that it could be valuable to reflect on my own status as a B1 learner of Polish who is teaching Polish to English-speaking teachers at our school, and particularly the impact that my relatively low level of proficiency might have on their learning. I don’t expect to offer any ground-breaking insights, but simply to share my story in the hope of prompting others. I am CELTA- and Delta-trained, as well as being a CELTA trainer and a Director of Studies. I have 10 years of teaching experience, and have done lots of CPD, including this blog and reading about methodology. A2 German via my school to two Czech students with no English – I had recently graduated with C1 in German and this was my first year as a full-time teacher. A0 French and Spanish (separately!) to Czech English-speaking friends as informal exchanges for other languages they spoke within my first three years of teaching – again, I was C1 in both cases. However, those teaching experiences felt quite different as I could speak only in L2 much more comfortably than I can in Polish. Having said that, I lacked a lot of functional classroom language as my own lessons when I was learning had been primarily conducted through English in the case of French and German, and were few and far between for Spanish! Despite all of this experience, I still feel I need a lot more training to conduct Polish lessons in the way I want to. This varies a lot depending on the lesson, and has also generally reduced the second time I have taught the same topic this year (it’s my second academic year of doing a fairly similar sequence of lessons). In vocabulary lessons, there is almost no English use. This is because the lessons primarily consist of drilling new language. As the items are almost all concrete, most of the meaning can be conveyed through pictures or the occasional mime. I am not confident with Polish grammatical terminology myself, meaning of necessity I use English terminology. As I am teaching absolute beginners and a lot of grammatical concepts are new to the students (such as cases), I have made the informed choice to use more English. This is the main type of lesson where English use has increased the second time round, rather than decreased. In functional language lessons, for example ‘at a restaurant’, meaning can be conveyed through the context, pictures and mime. I include some translation exercises, mostly to check understanding. The main way is to get them to work with a partner and translate the whole dialogue into English once we have worked with it a little in Polish. I tend not to use English in this case, but they do. Skills lessons are few and far between (see below) and when they do happen, I do a lot of translation for efficiency and ease of checking meaning – I suspect this is partly laziness on my part, partly lack of preparation, and partly lack of confidence. To sum up, although I believe that a shared fluent language (L1 for most of my students) has an important place in the classroom, I don’t think that my students really need to speak as much English as they do in these lessons. It has improved a little this year as the same phrases consistently pop up and I have now memorised them, such as Twoja kolej / Your turn. Having said that, I am not systematic at introducing classroom or functional language in English lessons I teach either, and this is something I would definitely like to work on in both English and Polish lessons in the next year or so. scripting instructions. However, this has slipped somewhat the second time I have taught lessons as I have become complacent: ‘It worked OK last time, so why wouldn’t it work OK this time.’ Erm, because I haven’t prepared in as much depth and last looked at the plan a year ago?! Really need to get on top of this! Looking up language using Google Translate (selectively! ), double-checking things in a Polish corpus and using bab.la, an all-in-one tool which I have recently discovered, containing a bilingual dictionary and corpus-based full sentence translations, great for checking how a word or phrase works in context. Playing pronunciation using Google Translate, Quizlet or Forvo (a pronouncing dictionary, particularly good for names of places and people which aren’t in traditional dictionaries). One particularly proud moment was when I managed to teach an impromptu lesson on plurals. Only two students came to class that day, rather than the 6+ I was expecting. One of them had missed the previous lesson on body parts which I was planning to build on, so the revision stage was extended with the student who had been there teaching the one who was absent. In the meantime I looked up plural rules that I was previously only half confidence with myself, and built up a table on the board based on words we’d covered in class already, mostly body parts and foods. They spotted patterns in the way plurals are formed in different genders, including spelling changes, copied the table, tested each other, tried out a few other words, and memorised the table. There was no freer practice as we’d run out of time in the lesson and my creativity hadn’t stretched that far, but I was still pretty proud of my first impromptu Polish lesson. As a side note, I recognize that I’m privileged to have a small group of students who want to be there, and therefore don’t really have to deal with classroom management when I do have problems with the language. Loss of face is also minimised as I am the manager of all of my students/teachers and we have a strong relationship outside the lesson, which I think mitigates the effects of when things don’t go as planned in my lessons. Summarising the background I have detailed above, I think the following are the main effects that my low level of proficiency have on my students. I focus largely on language rather than skills as it is easier for me to check and control. These language structures are also often ‘easy’, for example looking at singular adjectives but not plural ones as I’m not really sure of the rules of plural adjectives myself. Other areas I have noticed avoidance of are the alphabet and spelling-based activities, and minimal grammar input, meaning that my students don’t really have the building blocks to create and understand language independently outside the very controlled structures I have given them, which I think could impede their progress. My lack of confidence with classroom language means that it can be hard to introduce this to the students, and even harder to enforce use of Polish consistently when it could be used. My pronunciation is sometimes problematic, including passing on my own mistakes. For example I recently spend 50 minutes drilling The sun is shining / Świeci słońce with a final /tsi:/ sound on the first word before realising it should be /tʃi/ just before the end of the lesson. In a survey I did for this presentation, one of my students said it can be confusing when she’s heard one way of pronouncing a word outside the lesson, then when she tries it out I correct it to a form she has only heard from me. Finally, if I don’t check emergent language carefully I can end up teaching it wrong, such as using the spelling Francia instead of Francja in a lesson on countries. I’m obviously still learning the language myself, which means that I can empathise very strongly with my students, and they can empathise with me. I provide a realistic model of what they can work towards with their own Polish if they choose too. This is in contrast to a highly proficient speaker/native speaker teacher which it can be hard for beginners to imagine they could ever emulate. My problems with learning Polish are very recent, and I can normally still remember how I’ve overcome them or how important they are to overcome, passing this on to my students. I also focus on language in class which I’ve found particularly useful when living in Poland, so the lessons genuinely are survival Polish based on real needs rather than guesses. Because we all share English as a common tongue, I can fall back on it when necessary. One of the students also said it means I can understand easily when they use English grammar with Polish words! Another said that if there was no English at all in the lessons they would be much harder. A third commented that my low level of Polish means that my language is graded comfortably for them both in terms of speed and level. There is no running commentary on the lesson because I couldn’t produce one if I wanted to, and I use lots of gesture and demonstrations. useful exponents for classroom language, how to introduce them, and how to reinforce their use in class. typical instructions I need, and how to vary them for talking to one student or a group (verb conjugations). language about language (metalanguage and grammatical terminology) and how to present grammar in Polish to low-level students. how to demonstrate activities rather than give instructions. a range of easy-to-set-up, easy-to-vary activities for a variety of purposes. 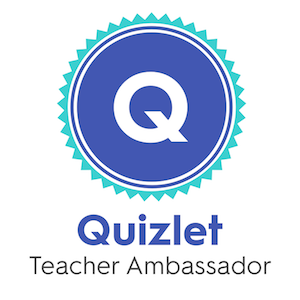 how to leverage technology like Quizlet and PowerPoint to support my language knowledge and add routine to lessons. recognising and exploiting suitable reference tools for checking language, such as bilingual dictionaries, Google Translate (which can be good for quick and dirty work! ), and corpora. how to continue learning a language myself, including finding the time and getting the support I need to do this. So if you’re working with low-proficiency teachers, should you focus more on methodology or language? Having said that, both are needed to build confidence in the teacher. A higher level of English would give those teachers access to a lot more professional development too, as a lot of resources still only exist in English. Gerhard Erasmus presented an IATEFL webinar called ‘Managing and developing teachers with lower English proficiency’ in August 2018. 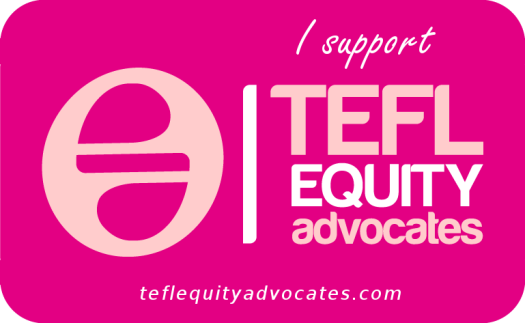 You need to be an IATEFL member to watch the webinar recording in the member’s area (how to join). Donald Freeman’s IATEFL 2015 plenary ‘Frozen in thought’ touched on the subject briefly in the ‘myth of proficiency as a goal’, and I believe he has written about it elsewhere. Lizzie Pinard summarised it on her blog. It is also included in that year’s Conference Selections, again available to members. 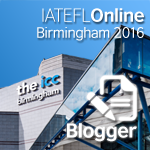 Damian Williams talked about Language development for teachers and an LDT Toolkit at IATEFL Birmingham 2016, a talk summarized on my blog (the second talk covered in the post) and (much more fully!) on Lizzie Pinard’s. Cambridge Assessment English have a Language for Teaching course available at A2, B1, and B2, which covers both classroom and general English. If you know of any other related resources, please do share them in the comments section. Since doing the talk eight days ago, I have taken a few hours to create a syllabus for next year’s Polish course. Following on from my reflections for IATEFL, I have based it more around a good quality Polish coursebook, making sure that I balance vocabulary, grammar and skills work much more. I’ve also tried to incorporate more homework to make sure that what we do in class will be as focused on using the language (not just remembering it/talking about it) as possible. I also plan to research more classroom language and return to scripting more of my instructions as part of my planning, if time permits. Watch this space to find out whether the new-look course increases the proficiency of my students any faster! I’ve said it before and I’ll say it again: the IATEFL conference is the best week of my year. It’s an opportunity to catch up with a lot of old friends, and to make new ones. It was also a great chance to meet some of the readers of this blog, so if you came up and said hi, thank you very much. I always enjoy meeting people and making the communication a bit more two-way, and finding out more about you 🙂 If you didn’t, please do next time you see me! I was particularly happy about how many first-timers I came across at the conference this year. About half of the people in the LAMSIG/TDSIG pre-conference event hadn’t been to a PCE before, and I guess a quarter of the people at the opening plenary were first timers at the conference. 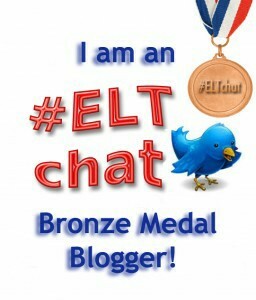 I didn’t meet Anna Neil, but I enjoyed this post she wrote about 10 things she wished she’d known before her first IATEFL. I also spoke to a few people who had never been to the UK before, and enjoyed the opportunity that the conference gave them to experience British culture. Mike Harrison and I had our first opportunity to present a How To session, introducing attendees to How to use social media at IATEFL and beyond. I was pleased to see that we had around 40-50 people joining us so early in the morning – thank you if you came! You can find the slides and a few extra links here. For many of the groups and communities I’m thinking of, all or most of their information, activities or discussions take place on Facebook and there is very little thought (it seems to me) about the fact that some people would prefer not to use Facebook, or simply don’t have an account. 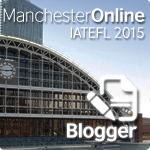 IATEFL also have an online coverage page including links to other bloggers. Lizzie Pinard wrote posts from each of the talks she went to, summarised here. Katherine Martinkevich wrote 6 posts summarising talks. This is the final one. Sharon Hartle wrote a few posts from the conference. This is the first one. The Modern Languages School at the University of Barcelona has various summaries. This one is about teacher development. Phil Longwell summarised his week in this post. 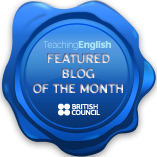 There will be a series of posts from scholarship winners on the IATEFL blog. Please add any more in the comments, and I hope to see you in Liverpool next year!